Parker's body leans against Barrow's right shoulder. His head is turned toward the driver's side window. The magazine and road map are evident at the floor. 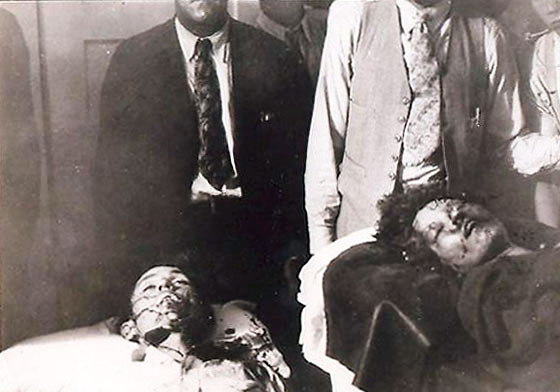 The bodies shortly after they were removed from the death car and taken into the funeral home. Amidst the lingering gun smoke at the ambush site, the officers inspected the vehicle and discovered a range of personal items such as clothings, books, paper and pen and Barrow’s saxophone, on which he was said to be a good player. Under a blanket in the back seat, officers found an arsenal of weapons including stolen automatic rifles, sawed-off semi-automatic shotguns, assorted handguns and several thousand rounds of ammunition, along with 15 sets of license plates from various states. Hinton, who had a small movie camera, filmed the ambush site, the road, the spot where the posse hid and even filmed the outlaw’s possessions stacked up outside the vehicle, as well as Jordan examining the personal belongings of the pair. Word of the ambush quickly spread when some of the posse went into town to call their respective bosses and to order a tow truck. A crowd soon gathered at the spot, and Gault and Alcorn, who had been left to guard the bodies, lost control of the jostling curious; one woman cut off bloody locks of Parker's hair and pieces from her dress, which were subsequently sold as souvenirs. Hinton returned to find a man trying to cut off Barrow's trigger finger. The coroner, arriving on the scene, saw the following: "...nearly everyone had begun collecting souvenirs such as shell casings, slivers of glass from the shattered car windows, and bloody pieces of clothing from the garments of Bonnie and Clyde. One eager man had opened his pocket knife, and was reaching into the car to cut off Clyde's left ear." The coroner enlisted Hamer for help in controlling the "circus-like atmosphere," and only then did people move away from the car. A tow truck eventually arrived, and the bullet-riddled Ford, still containing the bodies, was towed to the Conger Furniture Store & Funeral Parlor on Railroad Avenue in downtown Arcadia, across from the Illinois Central train station (which for years was a historical museum containing Bonnie and Clyde artifacts from that day.) 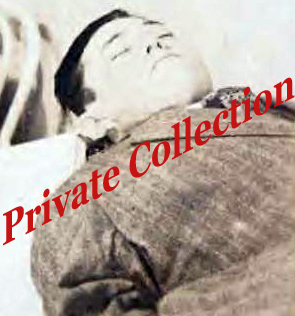 Someone had put a banket over Barrow's body, but Parker's was not covered. Stories abound that Jordan stopped the truck so that school children could learn a less about the evils of crime. In truth, crowds kept blocking the roadway, forcing the truck to stop. A long line of cars followed the tow truck into town. Preliminary embalming was done by Bailey in the small preparation room in back of the furniture store. It was estimated that the northwest Louisiana town swelled in population from 2,000 to 12,000 within hours, the curious throngs arriving by train, horseback, buggy and even plane. Beer, which normally sold for 10 cents a bottle, jumped to 25 cents; ham sandwiches quickly sold out. Clyde's father, Henry Barrow, arrived that afternoon from Texas and, after identifying his son's body, sat in a rocking chair in the furniture part of the Conger establishment and wept. Parker's brother Buster also traveled to the funeral home and took his sister back to Dallas, arriving back home the following morning. H.D. Darby, a young undertaker who worked for the McClure Funeral Parlor in nearby Ruston, and Sophia Stone, a home demonstration agent also from Ruston, also came to Arcadia to identify the bodies. 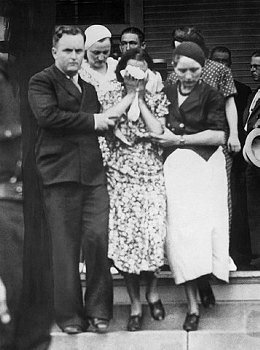 They had been kidnapped by the Barrow gang the previous year in Ruston, on April 27, 1933, and released near Waldo, Ark. Parker reportedly had laughed when she asked Darby his profession and discovered he was an undertaker. She remarked that maybe someday he would be working on her. As it turned out, she was correct. Darby assisted Bailey in embalming the outlaws. Crowds gather outside the funeral home/furniture store hoping for a possible glimpse of the bodies. Barrow and Parker wished to be buried side by side, but Emma Parker quickly refused any such request. Said Mrs. Parker: "He had her for two years and look what he did to her." Mrs. Parker did, however, want to grant her daughter's final wish, which was to be brought home, but the mobs surrounding the Parker house made that impossible. More than 20,000 people turned out for Parker's funeral, making it difficult for the family to reach the grave site. Parker's family used the now defunct McKamy-Campbell Funeral Home, then located on Forest Avenue (now Martin Luther King Jr. Boulevard) in Dallas, to conduct her funeral. Hubert "Buster" Parker accompanied his sister’s body back to Dallas in the McKamy-Campbell ambulance. Her services were held on Saturday, May 26, at 2 p.m., in the funeral home, under the direction of Allen D. Campbell. His son, Dr. Allen Campbell, later remembered that flowers came from everywhere, including some with cards allegedly from "Pretty Boy" Floyd and John Dillinger. (Not true, of course. Neither Floyd or Dillinger, or any other outlaw of the time, sent flowers.) The largest floral tribute was sent by a group of Dallas city newsboys; the sudden end of Bonnie and Clyde sold 500,000 newspapers in Dallas alone. Clyde's younger brother, L.C. Barrow, served as one of Parker's six pallbearers. Emma Parker made sure her daughter's hair was marcelled and her nails polished. She was dressed in a blue silk negligee and she was holding lilies from an unknown sender. 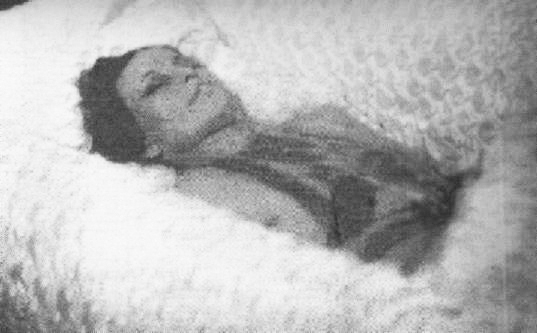 Her casket was silver with a white silk lining. Barrow's family used the Sparkman-Holtz-Brand Morticians, located in the A.H. Belo mansion on 2110 Ross Ave. in downtown Dallas. Thousands of people gathered outside both funeral homes hoping for a chance to view the bodies. In addition to the crowds, a variety of vendors, selling everything from ice cream to pictures of the couple, were also at both funeral homes. A life insurance policy on Parker was paid in full by American National of Galveston. Since then, the policy of pay-outs has changed to exclude pay-outs in cases of deaths caused by any criminal act by the insured. It is estimated more than 20,000 people filed passed the caskets to view the bodies. Parker's wake was quiet and respectful, but Barrow's began to get out of hand. When one viewer told Barrow's father, "I'm glad they killed him," Henry Barrow ordered the doors to be closed and locked and no one other than family and friends be admitted. The crowds at Barrow's funeral. Barrow's mother, Cumie, is seem at left at her son's funeral. Above is Parker's mother, Emma, Bonnie's brother Hubert (Buster) and her sister, Billie Jean Mace. Parker, above, and Barrow, at right, laid out and ready for burial. So, is this the end of the story? Yes and no. It's ended for Barrow and Parker, but are you wondering what happend to all the other players? If so, go to Barrow Revisited.